We're all too cool for fanny packs; but they serve a purpose. They're good for stashing your keys, cash and lipstick when you're running errands, walking the dog, or just don't feel like lugging your purse around. Yesterday we found a much better solution: the BootyWrap. 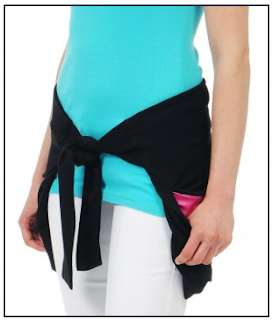 It's like wearing a sweatshirt around your waist with secure zippered pockets; but without the bulk. Plus, it covers your backside which is perfect for the gym. It comes in blue, white, black and grey for only $30. Order it at www.bootywrap.com and put that fanny pack back in the closet! There are times when it's definitely helpful to have your hands free, like when you're traveling or walking the dog. And BootyWrap is def more flattering than a traditional fanny pack.